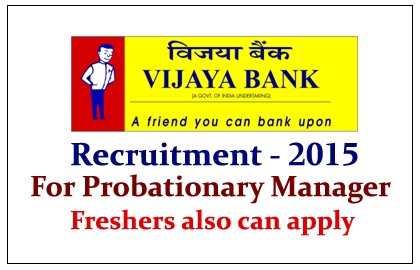 Vijaya Bank has announced the recruitment notification of 2015 for the post of Probationary Manager –Chartered Account Scale-II. Eligible candidates can apply for this post from 08.04.2015 to 29.04.2015. Candidates will be selected on the basis of the performance in the Online Examination, GD and personal interview. Eligible candidates can apply for this post through online by clicking the link given below or through the banks website:www.vijayabank.com from 08.04.2015 to 29.04.2015. After completing the online registration, take the hard copy of the system generated registration form and fill it. Then send the application to the below mentioned address. The envelope should be superscribed as “Application for the post of PROB Manager-Chartered Accountant-2015 (Post Code No. 01) in Vijaya Bank”. Your Application should reach the above address on or before 14.05.2015.